Torrance, California based MediaMation Inc., makers of the immersive motion EFX experience MX4D, will be expanding its presence with over 50 new global installations in Asia, Europe, North America, South America and Africa beginning in mid-2019. The announcement was made recently by CEO Howard Kiedaisch. The new installations jump from 346 facilities to over 400, a 15% increase of facility locations, pending to date. MX4D’s unique systems enhance children’s’ films, action-adventure, horror and comedy where the communal MX4D viewing experience provides outstanding features that include unique auditorium effects: fog, strobe, snow, rain, and bubbles. Full pneumatic (quiet, safe, low maintenance, non-electric) range of motion seats each are also part of the experience and include, through a patented process: neck and leg ticklers, wind, scent, water, rumblers and pokers. Expansion of MX4D theaters includes systems that are set to open in Q2 at Filmhouse Cinema’s Victoria Island Theatre in Lagos, Nigeria. Shortly after that Filmhouse’s Landmark Village in Lagos will open. These new installations in Africa join MX4D’s current presence in Egypt with MISR International’s Point 90 and Plaza Theatres in Cairo. In addition, MX4D Motion EFX Auditoriums are now under construction with Muvix Cinemas of Chile. The imminent first opening will be at La Fabrica. 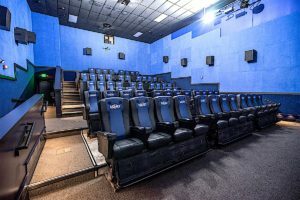 These MX4D branded auditoriums in South America join an already large motion EFX footprint in Colombia through an ongoing relationship with Cine Colombia. Other international installations set for this year include Inox Theatres’ first location at the Inorbit Mall, Malad West, Mumbai. This initial foray into India, joins a huge Asia presence for MX4D, with nearly 250 installs in greater China, a large EFX theater footprint in Japan, and many great grossing locations across the Middle East. Additional existing locations on the world’s largest continent include Thailand, the Philippines and Malaysia. New installs will be announced shortly in Europe, joining new facilities with Cineplexx in Austria, Serbia, and Croatia. Additional continental state-of-the-art MX4D theatres currently operate in France.